Interested in viewing the best registry scanner available? Take a look at a couple of our screenshots showing the Ultimate Registry Cleaner in action. 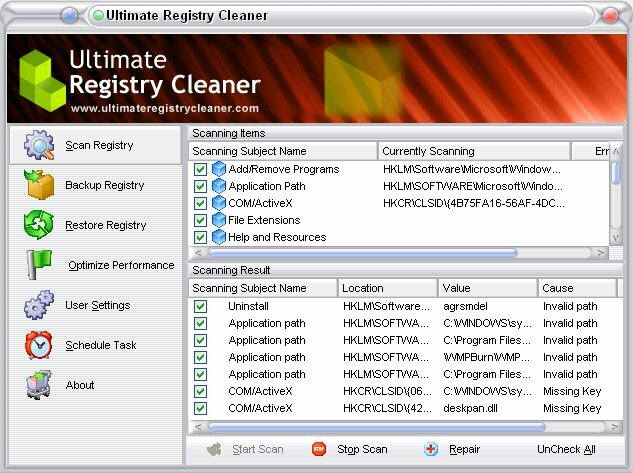 The Ultimate Registry Cleaner finds an average of 416 errors on each PC. 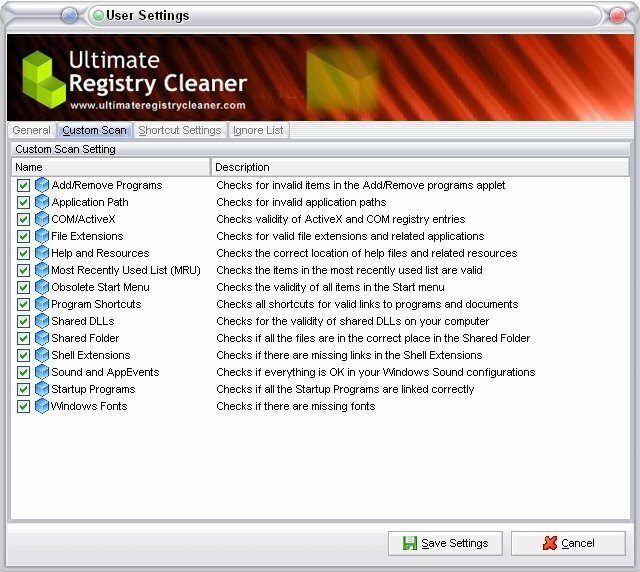 Using the Ultimate Registry Cleaner is easy! Simply click the "Start Scan" button and watch as the Ultimate Registry Cleaner uses its built-in scanning intelligence to locate hundreds of problems on your PC. 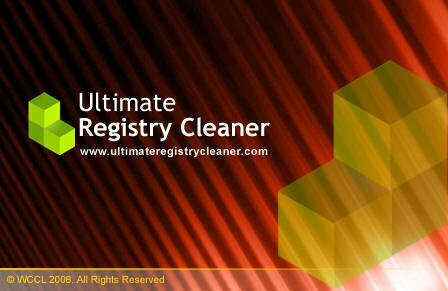 The Ultimate Registry Cleaner is totally customizable! You can specify exact what sort of errors you wish to scan for, create logs of any changes the Ultimate Registry Cleaner makes, provide advanced shortcut settings -- even backup and restore your registry. The Ultimate Registry Cleaner is designed to work flawlessly - for beginners and computer pros alike! Schedule Your Registry Cleaning - for Speedy, Worry-Free Computing! Who wants to remember to scan your PC each week? Simply tell the Ultimate Registry Cleaner to do all the hard work for you - and it will. That's right - the Ultimate Registry Cleaner can wake up at two in the morning and automatically fix errors on your PC and keep everything running smoothly for you. It's just like having your own private computer technician, with NO hassles and NO call-out fee!